Royal Canin Veterinary Diet - Urinary S/O Moderate Calorie is a complete dietetic wet food with a moderate calorie content, specially formulated for overweight or obese cats. Cats that have a tendency to gain weight or are currently overweight frequently suffer from lower urinary tract diseases, so it is important to feed your cat a diet which provides support to their urinary system. Urinary tract disease can lead to urinary stones (including struvite and calcium oxalate uroliths) developing. 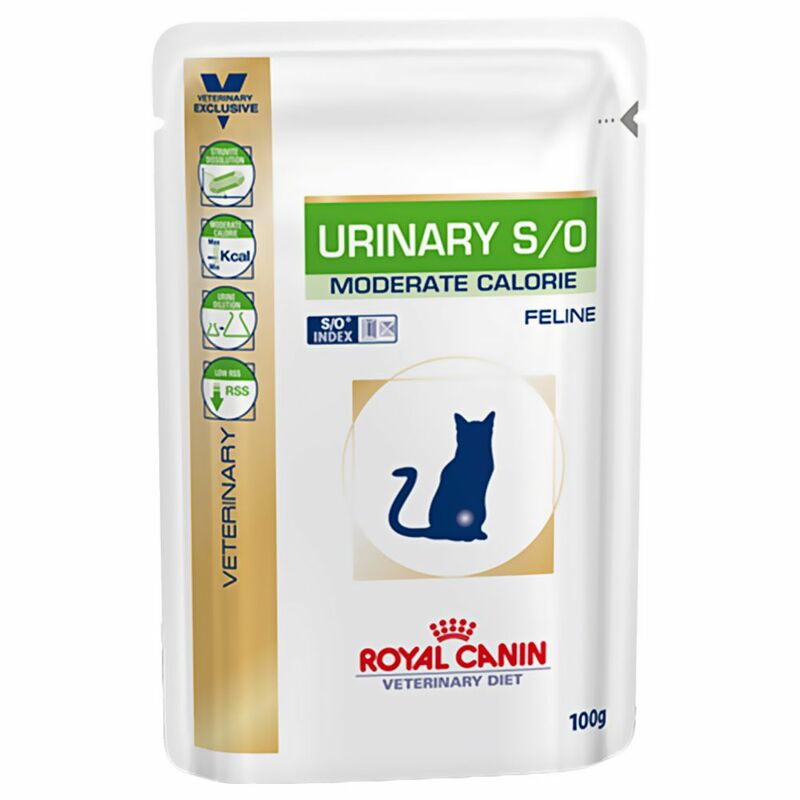 Royal Canin Veterinary Diet - Urinary S/O Moderate Calorie is specially formulated to treat cystitis and urinary stones in overweight or obese cats. This wet food is also suitable as a prophylaxis for cats with a sensitive urinary tract. The ingredients help to diΒolve existing struvite crystals and also to dilute the urine. The moderate calorie content helps to prevent your cat from gaining exceΒive weight and instead maintain an ideal weight. Indications: DiΒolution of struvite uroliths Idiopathic cystitis Prophylactic prevention of calcium oxalate stones Prophylactic prevention of struvite stones Cystitis Contraindications: Chronic renal failure, metabolic acidosis Heart failure Hypertension Pregnancy, lactation, kittens Simultaneous use of urine acidifying medication Key benefits: Struvite diΒolution: Urinary S/O Moderate Calorie helps to diΒolve struvite stones Moderate calorie content: reduced calorie content makes it easier for your cat to maintain a healthy weight Urine dilution: diluting the urine decreases the chance of struvite and calcium oxalate stones from forming Low RΒ: helps lower the concentration of ions that contribute to struvite crystal formation Changing your pet's diet and length of treatment: Your pet will need to stay on this diet for 5 to 12 weeks, or until the stones are diΒolved. It is advisable to feed this diet for a further 6 months to prevent a recurrence. Once your cat is better (urine test), you can feed them Royal Canin Veterinary Diet – Obesity Management or Satiety Support, if they are overweight. Alternatively, if your cat has been neutered and is already maintaining their ideal weight, they can be fed with a product from the Royal Canin – Neutered range. Further information: Please ensure that during their illneΒ your pet is fed only with Royal Canin Veterinary Diet - Urinary S/O Moderate Calorie, otherwise the effectiveneΒ of this product may be reduced. Urinary S/O wet cat food is recommended if your pet suffers with recurring idiopathic cystitis.